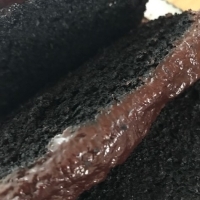 One of the deepest, darkest chocolate pound cakes I've made to date and my go to for the best chocolate pound cake ever! Great ingredients matter. I use King Arthur dark chocolate cocoa in this. Super moist but be careful to not over bake. Spray a standard 9x5 loaf pan and line it with a sheet of parchment paper, leaving the ends to hang long. This way you can life the frosted cake out for cleaner cutting. Cream the butter and sugar until light and fluffy. Beat in the eggs, one at a time, then the vanilla and espresso powder. Whisk together the sour cream and milk. Add the dry ingredients to the bowl alternately with the wet, beginning and ending with dry. Blend only until mixed, don't over beat. Turn the batter into the prepared loaf pan and spread out evenly. Bake for about 45-50 minutes until a toothpick inserted in the center comes out without wet batter clinging to it. Check your cake on the early side to avoid over-cooking. Set aside to cool. To make the ganache topping, heat the cream to a simmer and remove from heat. Add the chocolate and let sit for a minute, then stir until everything is melted and glossy. Pour over the cooled cake and then let the ganache firm up in the refrigerator for at least 2 hours. If you have used a parchment paper 'sling', gently pull the cake out of the pan to slice it. I was able to successfully double the recipe with one addition: 1/2 cup of Special Dark syrup. Since I used old aluminum Jello molds for the cakes, filled about 1/2 full, I bakes these at 350^ for 35 minutes. Tooth pick came out clean, yet cakes were moist. Topped with ganache and will be served with Almond Italian cream. I have 2 questions if I may; can his be doubled? Also, since I would using this recipe for 3" Bundt cakes, how what would you guess for baking time? Thanks, probably making this for couples only dinner.